This toy is no joke. This is one of those toys that is an absolutely must have. 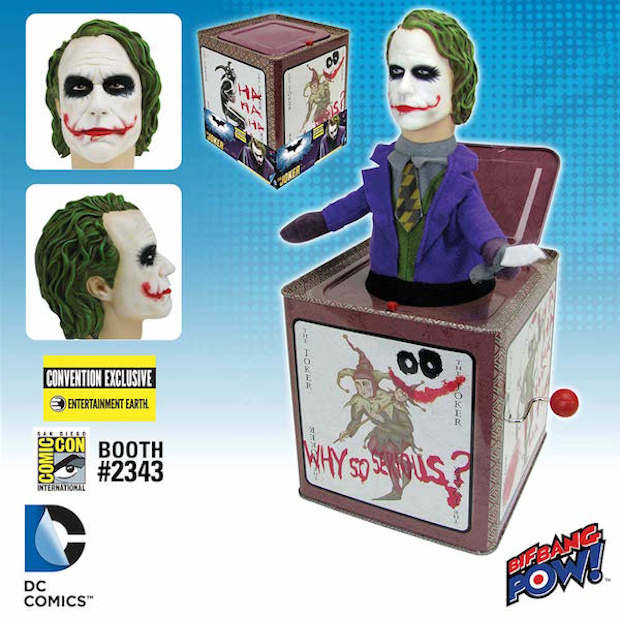 The SDCC exclusive The Dark Knight Joker Jack in the Box is a crazy and amazing piece of Joker memorabilia. This Joker in the Box has a detailed plastic head sculpted by 3D Systems and plays “Pop Goes the Weasel” when you turn the crank, naturally. It is limited to just 3,000 pieces, and will be available on July 20th, 2016 at the Entertainment Earth booth (#2343), and is available for pre-order online – if they don’t sell out to the Comic-Con crowd first. This is an awesomely creepy Joker toy. One that belongs in any Batman collection. I love all of the detailing on the box itself.